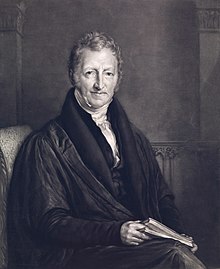 The Reverend Thomas Robert Malthus FRS (13 Februar 1766 – 29 December 1834) wis an Inglis cleric an scholar, influential in the fields o poleetical economy an demografie. Malthus himsel uised anly his middle name Robert. ↑ Several soorces gie Malthus's date o daith as 29 December 1834. See Meyers Konversationslexikon (Leipzig, 4th edition, 1885–1892), "Biography" bi Nigel Malthus (the memorial transcription reproduced in this airticle). But the 1911 Britannica gies 23 December 1834. ↑ "Malthus, Thomas Robert (MLTS784TR)". A Cambridge Alumni Database. University of Cambridge.